A column will be revived for 2,500 liras each and will be named after the sponsor who funds the maintenance work. With the slogan, “get an erected column in the ancient city of Perge,” the campaign is aiming to accelerate the ongoing archaeological excavations and restorations in Perge. As part of the campaign, the columns that were removed during the excavations will be re-erected on its original street, just as it was in the ancient era, with the help of sponsors. Antalya Mayor Münir Karaloğlu said the ancient city was home to several columns and there were areas that had not been excavated yet. “We don’t know how many columns will be found when the western part of the ancient city is opened,” he added. Stating that Perge was one of the most important Roman cities in Antalya, Karaloğlu said it was a unique city with its theater, stadium, towers, streets, fountain, gates and bath. 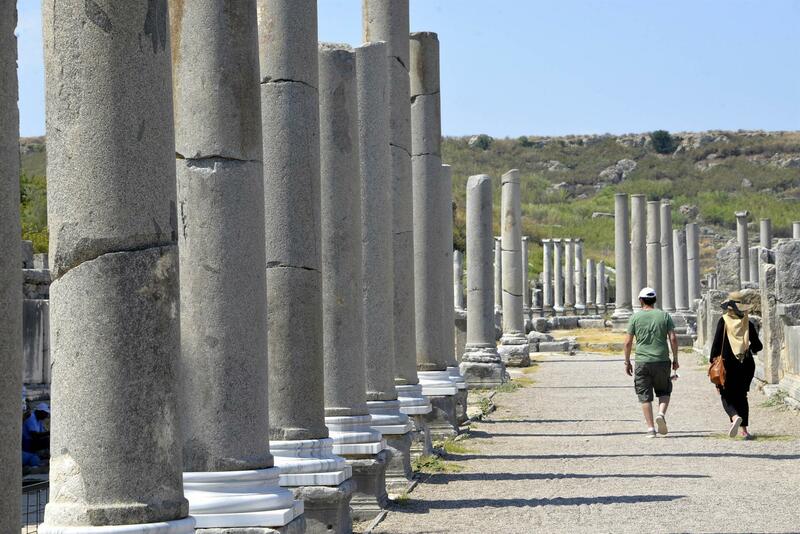 The mayor said there were people who previously contributed to the revival of the columns in Perge. “It is important for locals to protect their own values and raise awareness. It will also be an accelerating factor for our works. We are waiting for supports and will be thankful to everyone who will support us. The name of the sponsors will be attached to the columns without giving any damage to the historical artifacts,” he said. Antalya Chamber of Commerce President Davut Çetin said the launch of the “Year of Perge” was a right decision and they would contribute to the campaign, too. He called on the business world to do the same. “We need to do something to revive the columns of Perge. Every businessman, hotel and factory should revive one column at least. We also need to encourage the people of Antalya to join such campaigns. Its population is more than 2.3 million and if we receive even 1 lira as a donation from each person, 1,000 columns can be revived. Unfortunately, we did not make a donation campaign in the city. We were not able to protect Antalya as the locals of the city,” he added. Within the scope of the excavations that were initiated in Antalya in 1946 by Istanbul University, 128 columns were revived until 2012. Works have been carried out by the Antalya Museum Directorate since 2012 and more 222 columns were revived, too. Among them, 68 columns have the name of their sponsors such as Perge Rotary Club, Batur Hotel, Concorde Hotel, Zafer Export, Ayhan Sicimoğlu, Mücella-Feridun Uyar, the Antalya Promotional Foundation, Delphin Hotel and Nizamettin Şen. According to information provided by the Antalya Museum, 20 intact columns that were revived during the excavations await their sponsors. Fifty more columns are waiting to be restored in the restoration field. The 2,500-lira fee for sponsorship was determined by the Culture and Tourism Ministry.